The eyes are the main focal point of the face and are often called the windows to the soul. But San Clemente and Orange County residents with sagging upper eyelids may be self-conscious of the way their eyes appear. Sagging upper eyelids can cause a tired or droopy appearance, and can even sag so low that they interfere with vision. Droopy eyelids may be due to a number of factors, including age, fatty deposits in the eyelids or a sagging eyebrow. Because several conditions may cause drooping eyelids, there are two different surgeries for San Clemente and Orange County residents that may correct them – a brow lift or blepharoplasty, or an eyelid lift. Read on to learn about these two procedures, and to learn which procedure you might need if you, too, have drooping eyelids. For San Clemente and Orange County residents to understand what a brow lift is, they must first understand the proper position of the eyebrow. In a woman, the eyebrow begins level with the eyebrow bone, curving upwards in the middle and then back down. In a man, the eyebrow is typically more straight, and level with the eyebrow bone. A brow lift is indicated when the eyebrow sags below the eyebrow bone, causing droopy eyelids, forehead creases and wrinkles between the eyebrows. A brow lift is a cosmetic surgery procedure in which the brows are raised, either with a full endoscopic lift that makes 4 to 5 small incisions behind the hairline or with a temporal lift that makes small incisions behind the hairline in the temple area only. Blepharoplasty is eyelid surgery that can be performed to resolve a number of conditions, including drooping eyelids. Blepharoplasty can be performed on the upper eyelids, the lower eyelids or both. In the case of drooping upper eyelids, upper blepharoplasty may be indicated to surgically remove excess skin or fatty deposits. The incisions for upper blepharoplasty are disguised in your eyelid crease. Try This Test to See if You Need a Brow Lift or Blepharoplasty. Look straight into a mirror, making sure that you are not inadvertently raising your eyebrows. Put your index and middle fingers on both hands halfway between your eyebrows and hairline. Place one hand vertically aligned with the center of the eyebrow, and the other hand vertically aligned at the outer corner of the eyebrow. 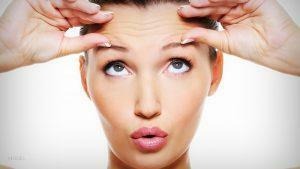 Very gently use your fingers to lift the forehead skin up to your scalp. As your forehead skin is lifted, pay attention to the look of your eyes. If the crease of your eyelid becomes more visible as you raise your forehead skin and your eyes look more youthful, you may be a good candidate for a brow lift. But, if your eyelids still look droopy, you may be a need a blepharoplasty, instead. Consult With Dr. Sikorski To Get a Definitive Answer. While you can try the simple test outlined above to get a better idea of what cosmetic surgery procedure is right for you, you’ll only know for sure by consulting with a board certified cosmetic surgeon. Call Dr. Sikorski of Natural Image OC today to schedule a consultation, and to determine if you need a brow lift or blepharoplasty. San Clemente and Orange County residents can reach Dr. Sikorski by calling (949) 448-0487.